Dr. K. Lam Straight Talk: Strokes of your Feet? Strokes are caused by a blockage in the artery going to the brain. When brain tissue is devoid of blood it starts to die to put it simply. Your feet can have a stroke, well sort of. It is not technically called a stroke in the feet but rather Peripheral Arterial Disease or P.A.D. This can happen over time, or via an acute embolism. Over time the artery can narrow due to genetics, cholesterol, smoking history, unhealthy diet, diabetes, etc. The arteries first will stiffen, then plague will form within the wall of the artery to cause narrowing, the narrow passageway of blood becomes more a problem below the knees when the arteries narrow and gets narrower quickly into the foot. Acute embolism happens when there is a clot / plague in a big artery up in the belly or even closer to the heart. This ball of plague will get logged in a narrow artery downstream in the leg , ankle or foot. Vascular surgeons and interventional radiologists now have a great way to open these clogs via a small rotation burr in the artery, "laser" (picture Dr. Evil), or a small hook, just like fishing out a clot. Previously, a bypass surgery where vein or graft is used to replace the clogged artery was more commonly done. Nowadays more surgeons are going to the endovascular (inside vascular structures) procedures. The endovascular revolution has made it possible for patients to get revascularization, blood flow back to the region of previous dead or suffocating tissue. This will not save every limb or toe but can potentially save a person's leg or life. Your team of doctors should include a podiatrist, why? I always tell my patients if you lose your toes or feet we lose our business, jokingly of course but we do have an incentive to try and save what we can, either via prompt refer to a vascular colleague or proper wound care protocols. Overall, the patient needs to take personal responsibility for the reason why they have P.A.D. If you are a diabetic, smoker with high cholesterol and still continue such lifestyle after, your foot / ankle is as good as gone. One infectious doctor who is an avid hunter told a patient you might has well take a gun and shoot the other foot off, gross? insensitive? Perhaps as doctors it does frustrate us when we see patients continue to harm themselves with things that only they can change, a pill or surgery can't change it all for you. 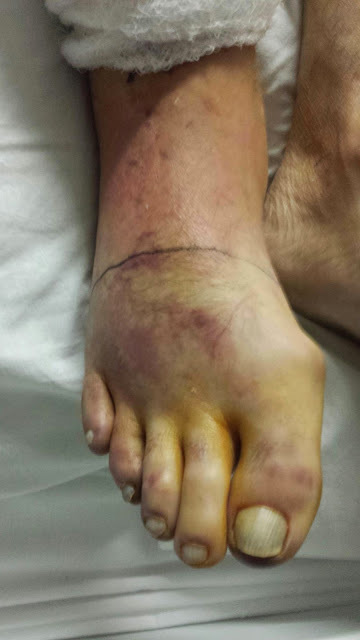 Below is a clinical picture of dead toes just prior to scheduling amputation. Symptoms are uncontrollable pain , cold feet and lack of warmth in the feet. 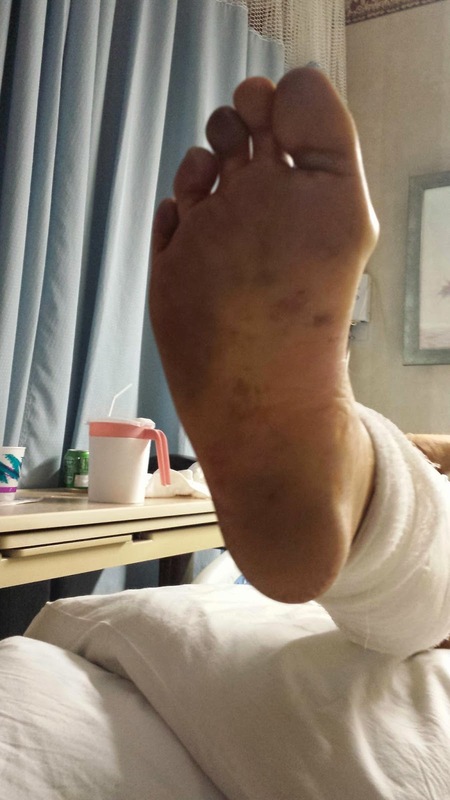 Patient lost 3/4 of his foot to smoking, diabetes, etc. 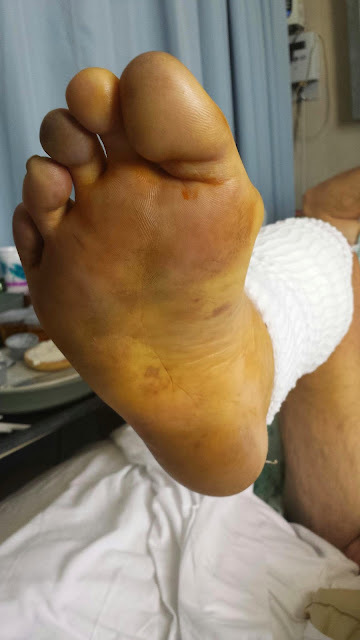 Patient requested amputation vs trying to save the foot utilizing hyberbaric oxygen treatment as an option.